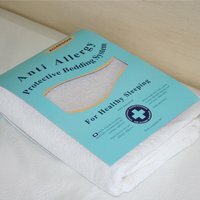 This is a best seller, a range of waterproof mattress protection. The top is soft absorbent 100% cotton terry: laminated to a waterproof, breathable, virtually undetectable polyurethane back soft to the touch and noiseless in use. Cool in the summer, warm in the winter anti allergy, dust mite proof and machine washable.